Nicaragua, the largest country in Central America bordered by Honduras, Costa Rica, Pacific Ocean and the Caribbean Sea has a total land area of 50,193 square miles and a population of around 5.9 million. Nicaragua, the second poorest country in the Americas, is on a quest to change that image. It has privatized many state enterprises, tamed inflation to be in the single digit, and aggressively pursued tourism opportunities whose return positively affected many industries. Agriculture, tourism, banking, fisheries, mining and timber are the main sectors of its economy. Bananas, coffee, sugar, beef and tobacco are the chief cash crops. 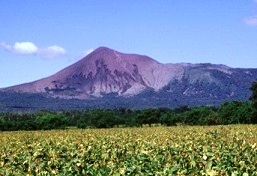 Nicaragua has such unique and special ecosystems that contribute immensely to Mesoamerica’s biodiversity hotspot designation. June through January is the best time to visit this land of lakes and volcanoes. Visitors come in various roles – tourists, surfers, ecologists, volcano specialists, business people and relatives. Its beaches, landscape, agritourism, ecotourism, and culture cater to please them all. A great variety of birds, animals and marine life can be found freely here. Spanish and Creole influences are felt strongly in Nicaraguan cuisine. Corn is an integral part and is used in almost all dishes. Gallo pinto (rice, beans, and meat) is their national dish and is consumed as hearty breakfast. Indigenous fruits and vegetables such as jocote, mango, papaya, tamarindo, banana, avocado, yuca and cilantro also find their way into most every meal. Moon Nicaragua 978-1598805949 $14 Best Guide Book to Nicaragua. 25-page traveler’s introduction followed by sections on Managua, Granada, Masaya and the Pueblos Blancos, Rivas and La Isla de Ometepe, San Juan del Sur and the Southwest Coast, Leon and the Volcanic Lowlands, Esteli and the Segovias, and the Matagalta and Jinotega Highlands. Nicaragua Travel Map 978-1553413486 $12 1:755,000 Scale. Includes inset map of Managua. The first stamps of Nicaragua were a set of two stamps released on December 2, 1862 showing Liberty Cap on Mountain Peak from Seal of Country. The set (Scott #1 to #2) catalogs for around $225 mint and around $80 used. Two other sets in the same design were released in 1869 and 1878. The first of those sets (Scott #3 to #7) catalogs for around $70 mint and around $10 for used while the latter set (Scott #8 to #12) catalogs for around $40 mint and around $10 used. The first sets were followed in 1882 by a Seal of Nicaragua set in 1882. The set (Scott #13 to #19) is remarkably inexpensive and catalogs for around $4 mint. Used copies are much more sought after and catalogs for around $35. Several sets released during the period till 1895 are similarly inexpensive. Coat of Arms and Map of Nicaragua themes were the primary sets of Nicaragua till the turn of the century. Some of those sets are pretty valuable. Chief among them were a set of nine stamps released in 1897 (Scott #98A to #98I) which catalog for around $270 mint and around $100 used and a set of eleven stamps released in 1898 (Scott #109A to #109M) which catalog for around $200. Nicaragua declared independence from Spain on September 15, 1821 and gained recognition on July 25, 1850. Nicaragua released a set of eleven stamps on September 15, 1930 showing the New Post Office at Managua. The set (Scott #525 to #535) catalogs for around $55 mint and around the same for used. The premium valuation is due to the fact that the stamps were on sale only on the day of issue and in April, 1931. The set was released to mark the opening of the new general post office at Managua. Managua was hit by an Earthquake on March 31, 1931. A set of thirteen stamps were released on January 1, 1932 to commemorate the earthquake. The set was also on sale only for one day on January 1, 1932 and is highly valued at around $30 mint. The United States intervened in support of conservative-led forces rebelling against President Zelaya in 1909. The US Marines remained in Nicaragua between 1912 to 1933 and the conservative party led by the Chamorro family controlled the government during the period. A set of thirteen stamps released on July 15, 1949 to mark the tenth World Series of Amateur Baseball of 1948. The set (Scott #717 to #729) catalogs for around $15 MNH and around $6 for used. The designs show softball, boy scout, badge, and flag, pole vault, diving, bicycling, proposed stadium, baseball, boxing, basketball, regatta, table tennis, soccer, and tennis. The denominations were also released in a souvenir sheet of four. The set of 13 sheets catalog for around $100. A set of ten stamps released on May 15, 1971 showing symbolic designs of scientific formulas. The set (Scott #877 to #881 and #C161 to #C165) catalogs for around $8 MNH or used. The designs show Newton’s gravity law, Einstein’s relativity theory, Tsiolkovski’s law about speed of rockets, and Maxwell’s law of electromagnetism. The set was released in the Mathematical equations which changed the world theme. The back of each stamp featured a descriptive paragraph. In 1979, the Nicaraguan dictatorship of Somoza was ousted in the Nicaraguan Revolution. A sheet of twenty stamps released on August 7, 1991 in the Fauna of Rainforest theme. The set (Scott #1861a-t) catalogs for around $20 MNH and around half that for used. The designs show yellow-headed Amazon, toucan, scarlet macaw, quetzal, spider monkey, capuchin monkey, sloth, oropendola, violet sabrewing, tamandua, jaguarundi, boa constrictor, iguana, jaguar, white-necked Jacobin, doxocopa clothilda, dismorphia deione, golden arrow-poison frog, callithomia hezia, and chameleon. A set of two stamps released on October 12, 2004 featuring Tourist Attractions. The set (Scott #2442 to #2443) catalogs for around $2 MNH or used. The designs show Rio Tapou, Rio San Juan Forest Refuge, and Mombacho Volcano Natural Reserve. The first coins of Nicaragua were Republic General Coinage (100 Centavos = 1 Peso) Copper-Nickel Centavos issued in 1878. The issues had mintage well in the 100,000’s depending on denomination, but still catalogs for upwards of $80 in UNC. Proofs are very rare and fetch upwards of $450. Nicaragua has issued several commemorative gold coins over the years starting with the 1967 1.03 troy ounce gold coin to mark the 100th anniversary of the birth of Ruben Dario. Gold coins have low mintage in the 1000s and fetch a good premium over bullion value. Coins $1 and up Common UNCs start around $1. UNCs from the 1960s and prior dates start around $10. 1995 FAO Silver Proofs, Rare Silver Cordobas from the 1910s in VF, etc start around $30. Recent Low Mintage Silver Proofs, Graded Silver Coins from the early 20th century in MS60 or better grades, etc start around $50. Gold Proofs, Silver Coins of the 19th century graded AU58 or better, etc go well into the 100s. Paper Money Few Cents and up Common UNCs starts at well under a dollar. Polymer Banknotes from 2000s in UNC, Recent High Values, etc start around $10. Consecutive Serial Number UNCs with 5-pieces or more, Recent Polymer Replacements, etc start around $25. Bundles, Rare Specimen Proofs, etc starts around $50. High Value Bundles, Rare Dates, etc go well into the 100s. Pottery, leather goods, clothing, shoes and handicrafts are the typical souvenirs. Art $15 and up Cuban political posters start around $15. Vintage Soapstone Carvings start around $50. Armando Morales lithographs start well into the 100s. Antiques $10 and up 19th century maps start around $10. 18th century and older maps start around $50. Miscellaneous Collectibles $2 and up Patches, Flags, Pins, etc start around $2. Vintage military award badges, Cigar Wood Boxes, etc start around $20.